Prior to founding MEMOTEXT, Amos Adler was a business solutions architect for the Bell Canada Enterprises (BCE) group of Companies. While at Bell Canada, Bell Mobility and other operating entities, he managed the design, implementation and integration of various CRM, ERP, Voice/Speech Recognition, IVR and web 2.0 and CTI – legacy system integration initiatives. MEMOTEXT is a professional services firm and SaaS engine that focusses solely on medication and treatment compliance programs for healthcare stakeholders. 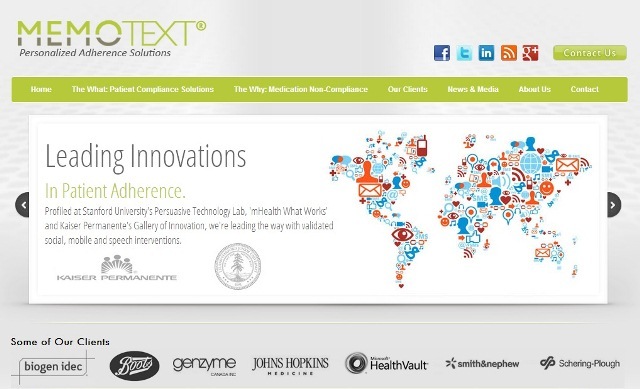 MEMOTEXT® specializes in evidence based personalization of patient compliance interventions. With a proprietary methodology and The MEMOTEXT Personologic™ inference engine, we integrate behavior modification, education and real-time support into the everyday lives of patients using everyday technologies patients already have. Our ability to learn and remember previously reported knowledge, intentions and behaviors allows us to adapt communications to changing attitudes, knowledge levels and circumstances of each patient using best of breed, secure mobile, speech and social medication adherence tools. MO: What problem is MEMOTEXT solving? Amos: The problem is not just that patients are not taking their medication, they are also not following the lifestyle required to improve their health outcomes. There are direct and indirect ramifications of patient non-compliance. Studies show 50% of U.S. patients do not take their medicines as prescribed, resulting in over $300 billion annually in direct and indirect costs to the healthcare system and the economy. Non-compliance has been associated with as many as 125,000 deaths per year, 20% of cases of preventable adverse drug events, 33-63% of medication-related hospital administrations and an additional $2,000 a year/patient in medical costs for physician visits. MO: What kind of barriers contribute to the non-compliance of patience regarding their medication and treatment? Amos: The evidence shows several barriers including things like the cost of medications, a-symptomatic diseases (where you don’t feel sick), complexities of treatment, patient experiencing side-effects that they don’t like, depression, physical and/or cognitive impairments and even simply forgetting. The list goes on and on. A very significant percentage of all prescriptions are not even filled the first time they are prescribed. It has been referred to as ‘America’s other drug problem’. MO: Can you talk a bit about the development process behind MEMOTEXT, the challenges you encountered and how you overcame them? Amos: MEMOTEXT started off as a very simple database driven application. As we researched the opportunity, we realized that the driver for our business was not technology but behavioral change. Its not pinging messages at people that helps patients, its understanding their state and engaging them in a relevant way that helps make the difference. This led to us focusing on the intelligence behind our communications as opposed to the media and technology there. A lot of medical-speak is about patient centricity. We design with the patient in mind and ensure that we get results. But a working app is only the skin to get in the game. Integrating into the healthcare continuum, building credibility with stakeholders and recruiting patients onto programs still dominate the world of mobile health and behavior change. In fact patients still vastly prefer to communicate with older technologies (i.e phone, text messaging). Our challenges were never really technical but related to sales cycles with large healthcare organizations and the culture of conservatism and credibility building, our philosophy was basically; fill the pipeline and nurture the cycle but not in an “in-your-face” way. You can’t push healthcare technology in the way other B2B businesses can aggressively push. MO: The healthcare systems are vastly different between the US and the UK. I’d love to hear how your approach to marketing MEMOTEXT would vary in each country or would if it would remain mostly the same? Amos: We service Canada, US, UK and now even Australia and the rest of the European Union (EU). There are vast differences in the healthcare systems and what motivates different stakeholders. Fortunately for us, there is always a benefit to having people adhere to a treatment regimen regardless of health-system. Its always financially beneficial to someone for you to be healthier. The US is much more open about being driven by the bottom line. But at the end of the day, cost-benefit and ROI have to drive health care solutions. If its not scalable it won’t fly. MO: Can you elaborate on the benefits of using MEMOTEXT for payers, pharma and the overall healthcare system? Amos: Our pharma manufacturer clients enjoy increased physician engagement between pharmaceutical representatives and health care practitioners (HCPs) because HCPs always enjoy support programs that ultimately help patients. Consequently, one of the side benefits of our programs has been that increased engagement between sales reps and HCPs. Ultimately our programs create significant and measurable revenue improvements for pharmaceutical brands. Pharmacies enjoy increased consumer loyalty and pharmacy spends. And the payer, whether it’s a health plan, employer, insurance company, HMO or public entity experiences a decrease in long-term critical costs and losses due to lost productivity. The overall health system has the ability to benefit with increased pharma spends and lower overall healthcare costs. This has been proven again and again that despite the increased pharma spend the overall health care cost of a chronically ill patient is significantly lower. MO: Can you elaborate on the variety of techniques that you use to customize the patient experience? Amos: We create customized programs using our proprietary MEMOTEXT PersonoLogic® Engine (MPE). This engine intelligently adjusts communication with the patient in real time, based on reported attitudes, beliefs and circumstances. We learn about a patient’s state of mind, and stage of change. We learn why the patient misses prescribed doses. We use interactive media and evidence-based content tailored to each patient’s individual lifestyle. We use interactive media to inspire behavior change by making it easier to follow a medication or treatment regimen. MO: What have been some of the most surprising discoveries that you’ve made while conducting your research? Amos: With more than 20 trials and pilots over the last few years we’ve learned that people really like to interact with a virtual persona. We’ve learned that people use technology in different ways and use different media depending on who they are, what condition they are managing and where they are in the world. For example Type 2 Diabetics in the UK are more likely to use SMS than the same demographic in the US. We’re also driven by the fact that we’ve learned 2 major lessons 1) Everyone is different and has a different reason for adhering to treatments and 2) People change. We’re at a point where our technology should know where we are at and adjust accordingly that’s when technology becomes useful. Find the right Domain Name for your business at Fabulous.com! Mike Michalowicz	Author of "The Toilet Paper Entrepreneur."